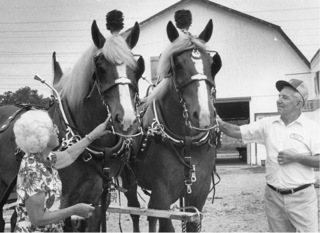 An annual event on the Village Green for over 30 years, the Dixboro Fair is held on the first Saturday in August. Food, games, live music, live auction at 12pm, petting zoo, and more! Proceeds benefit local charities. All proceeds for 2015 will benefit Habitat for Humanity, and the Restoration of the 1888 Dixboro Schoolhouse. Come out and enjoy our family-focused Fair, as always a wonderful day! and tasting the homemade pies and cakes. Plenty of adventure for the children and young at heart. Poke your heads into the classic cars, take a tour of the Church. Land a great deal at the auction. Shop at the Artisan Booths. Relax under the tent with neighbors, friends, and family. Like our event on Facebook to get updates and more information! 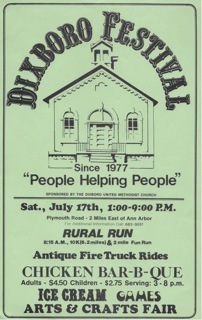 This year's festive DIXBORO COMMUNITY FAIR (August 1, 2015) was sown in 1977 (38 years ago) by Dixboro UMC Rev. Dr. Hal Ferris and active parishioner Richard Bird. 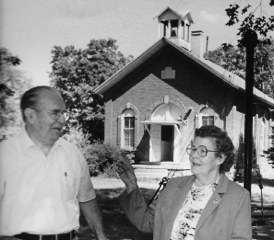 Both were forward-thinking enthusiasts who dovetailed the annual event to their successful community celebration of the USA 200th birthday the year prior. That year, the ambitious, patriotic residents of the hamlet attempted to link hands in a show of American unity along Church Road from Plymouth Road west to Dixboro Road. So, the annual Dixboro Festival- as it was originally known- began to evolve in 1977 with a foundation of a chicken bar-b-que and a new twist each year including an arts and crafts fair, Belgian horse-pulled cart rides (Ola and Zina Bolgos), an observance of the Dixboro School house centennial (Ivan Parker and sister Leona Parker Bunnell shown, former teachers) and in 1980 a "Rural Run" distance fun run co-coordinated by Glynda Freeman with runners dodging downed power lines! Yikes!